The Cassini probe has today begun the first of 22 dives in between the rings of Saturn and the planet's atmosphere. Cassini between Saturn and the rings. Credit: NASA/JPL-Caltech. The dives are the beginning of a dramatic end to the mission. After more than a decade of ground-breaking discoveries, and with little fuel left, it has been decided to end the mission by plunging it into Saturn’s atmosphere on 15 September 2017. The UK has involvement on 4 instruments onboard the Cassini spacecraft, including as the Principal Investigator for the magnetometer, built to measure planetary and inter-planetary magnetic fields and developed by a team at Imperial College, London. Like a highly-sensitive and extremely precise compass, Cassini’s Magnetometer records the direction and strength of magnetic fields around the spacecraft. This helps scientists learn about the interiors of Saturn and its moons, along with the planet’s magnetosphere - the giant region of space around the planet influenced by its magnetic field. The instrument has a long history and was built by Professor David Southwood and his team at Imperial College. It was selected for the NASA spacecraft in 1991 and work began immediately. David moved to ESA the same month Cassini launched in 1997 and management of the instrument was passed to his successor, Professor Michele Dougherty. 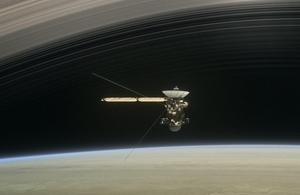 Today’s first close in dive by the Cassini spacecraft in between the rings and atmosphere of Saturn signals the start of its final mission phase, the Grand Finale, where the focus will be on understanding the interior of Saturn, its rings and atmosphere and last but not least how long a day is on Saturn. With the repeated dives in the as yet unvisited region, Cassini will conclude its journey by collecting unprecedented data to address fundamental questions about the origin of Saturn and its ring system. The Cassini-Huygens spacecraft embarked on a seven-year voyage across the Solar System, eventually reaching Saturn in July 2004. Several months later, the Cassini orbiter released ESA’s Huygens probe, which landed on Titan on 14 January 2005 – the first landing in the outer Solar System. Another of Cassini’s breakthroughs was the detection of a towering plume of water vapour and organic material spraying into space from warm fractures near the south pole of Saturn’s icy moon, Enceladus. These salt-rich jets indicate that an underground sea of liquid water is lurking only a few kilometres below the moon’s icy surface, which was confirmed by gravity and rotation measurements. A recent analysis of data collected during flybys of Enceladus with the Cassini Ion Neutral Mass Spectrometer also revealed hydrogen gas in the plume, suggesting that rock might be reacting with warm water on the seafloor of the moon’s subsurface ocean. This hydrothermal activity could provide a chemical energy source for life, enabling non-photosynthetic biological processes. This is similar to the activity found near the hydrothermal vents on the Earth’s ocean floor and points to the potential habitability of Enceladus’ underground ocean.